Working people filled the Capitol rotunda in St. Paul today, celebrating their freedom to join together for a voice on the job and pledging to fight corporate attacks with urgency and solidarity. 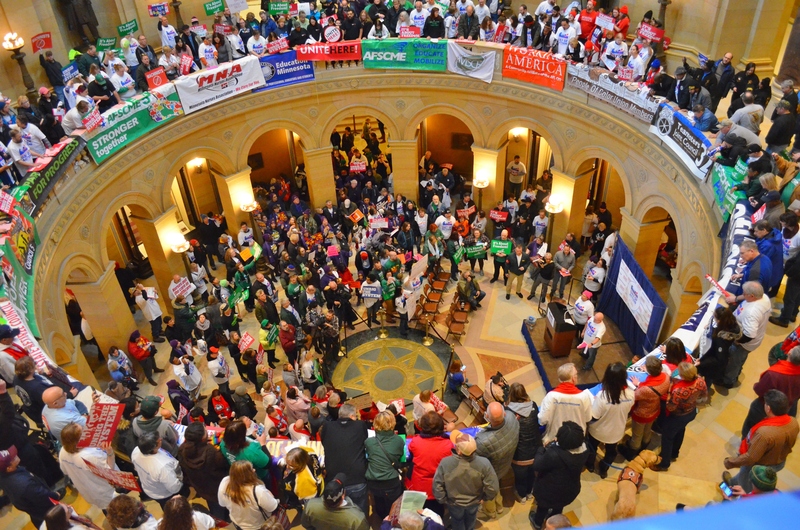 The rally in St. Paul was one of more than two dozen across the country highlighting the benefits of collective bargaining and the critical role union members play in their communities. Anne Bipes, who works as a secretary in a west-metro school district, attended the rally with members of her union, Service Employees Local 284. She said strong unions mean more than “just pay and benefits” for workers like her. “It’s about equity and justice within our society, about equality for working people,” Bipes explained. The day of action comes two days before the U.S. Supreme Court will hear arguments in a lawsuit, bankrolled by corporate special interests, challenging the ability of Local 284 and other public sector employee unions to collect fair-share fees from workers they are legally required to represent. The court’s conservative majority is likely to side with the plaintiff in Janus v. AFSCME Council 31, and the decision, expected as early as April, could make right-to-work conditions in the public sector the law of the land. But public-sector workers aren’t cowering. They traveled in busloads to the Capitol, wore their union colors and carried signs vowing that no court ruling will keep them from joining together to fight for themselves and their communities. Jim Glazer, a teacher in the South Washington County Schools and member of Education Minnesota, joined the rally to be “part of the energy” fueling actions across the country today. Public-sector workers aren’t standing alone either. Private sector union members bolstered their ranks at the Capitol, as did allies from immigrant rights groups, faith organizations and the business community. Wendy Anderson, a Century Link retiree who remains active in her union, Local 7201 of the Communications Workers of America, said the landscape for unions is changing, but she thinks working people are up to the test.